Davis (coach's decision) is inactive for Saturday's playoff game against the Cowboys, Myles Simmons of the Rams' official site reports. Analysis: Davis was previously dealing with a shoulder issue but he had no limitations at practice this week. Todd Gurley (knee) is set to retake his starting role with C.J. Anderson serving as the No. 2 running back, sending Davis back to the inactive list. Davis (shoulder) is active for Sunday's game against the 49ers, Myles Simmons of the Rams' official site reports. Davis (shoulder) is listed as questionable for Sunday's game against the 49ers, Myles Simmons of the Rams' official website reports. Analysis: Davis was active last week while dealing with the same shoulder injury, but he didn't play any snaps in a 31-9 win over the Cardinals. He may be headed for another week as nothing more than an emergency option, with C.J. Anderson and John Kelly both better bets to handle the snaps vacated by Todd Gurley (knee). Davis (shoulder) practiced in a limited capacity Thursday, Myles Simmons of the Rams' official site reports. Davis (shoulder) was limited at Wednesday's walk-through session, Cameron DaSilva of USA Today reports. Analysis: Davis' listing is merely an estimation, but the Rams still have two practices in which he can put in some on-field reps this week. While he was active for Sunday's win over the Cardinals, Davis didn't take the field. Instead, C.J. Anderson (20 carries) and John Kelly (10) benefited in the absence of top back Todd Gurley (knee). A similar breakdown may happen in the regular-season finale if the Rams opt to get Gurley and Davis healthy for the playoffs. Davis (shoulder) is listed as active Sunday in Arizona, Gary Klein of the Los Angeles Times reports. Analysis: Despite missing practice all week due to a shoulder injury, Davis will be available to a backfield without the services of Todd Gurley (knee). The breakdown of potential touches between Davis, John Kelly and C.J. Anderson is unclear, but coach Sean McVay hinted Anderson would get the start if this was the reality. Perhaps Davis' availability will change that, especially since the second-year back has turned three career carries into 20 yards. 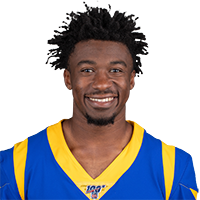 Davis (shoulder) is listed as questionable for Sunday's game against the Cardinals, Myles Simmons of the Rams' official site reports. Davis (shoulder) was a non-participant at Thursday's practice, Gary Klein of the Los Angeles Times reports. Analysis: If healthy, Davis would stand to benefit in the event Todd Gurley (knee) is limited or sidelined Sunday in Arizona. Unfortunately, Davis has joined Gurley in the trainer's room all week due to a shoulder injury. There's an expectation within the organization that Gurley will give it a go this weekend, but no such sentiment has been expressed about Davis. The remaining backfield options in LA are John Kelly and recent addition C.J. Anderson. Davis (shoulder) didn't take part in Wednesday's walk-through practice, Lindsey Thiry of ESPN.com reports. Davis (shoulder) could see additional snaps Sunday if Todd Gurley (knee) is unable to play, though Davis' status will be monitored throughout the week as well, Gary Klein of the Los Angeles Times reports. Analysis: Davis exited Sunday's contest against the Eagles with a shoulder injury, which could put a possible role expansion in Week 16 on hold. Given how heavily the Rams utilize Gurley, it isn't surprising that Davis saw just four offensive snaps versus the Eagles on Sunday and has taken just five overall this season. Davis would likely slot in behind John Kelly in the pecking order for carries against the Cardinals if Gurley sits, but Davis' status is something to watch as well. Davis hurt his shoulder during Sunday's game against the Eagles and is questionable to return, Gary Klein of the Los Angeles Times reports. Analysis: Davis took one carry for no gain prior to his exit in the second quarter. John Kelly will handle whatever scraps Todd Gurley leaves behind if Davis can't rejoin the contest. Davis rushed once for 19 yards during Sunday's 15-6 loss to Chicago. It was his first carry of the season, and he had just a single run as a rookie last year. Analysis: With Malcolm Brown (shoulder) out, it was Davis who spelled No. 1 back Todd Gurley on the final play of the game. Gurley played each of the previous 62 offensive snaps, so even though Davis was the first man up behind the bell-cow runner, it's probably not a great virtual setup. Davis likely shouldn't be viewed as a reliable option in the majority of fantasy settings. Davis will compete with John Kelly for backup work out of the backfield while Malcolm Brown (clavicle) is unavailable, Gary Klein of the Los Angeles Times reports. 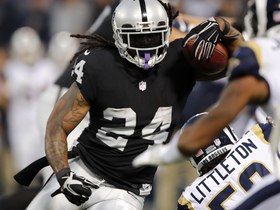 Oakland Raiders running back Marshawn Lynch throws Los Angeles Rams linebacker Cory Littleton to turf with stiff arm.